General Dynamics Astronautics, the firm which conducted the launch, had the key gold-plated and engraved with the following message: "Wally Schirra, MA-8 Orbital Launch, 10-3-62 7:15 a.m." The opposite side of the key stated: "Atlas, Launch Console Arming Key, Mercury Sigma 7, General Dynamics Astronautics." 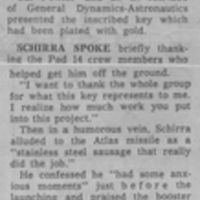 Original newspaper article: "Schirra Gets Memento Key for Orbits." 1963: Private Collection of Dr. Calvin D. Fowler. Digital reproduction of original newspaper article: "Schirra Gets Memento Key for Orbits." 1963. Astronaut Group 1; astronauts; Atlas; B. G. McNabb; Cal Fowler; Calvin D. Fowler; General Dynamics/Astronautics; Mercury 7; Mercury Seven; NASA; National Aeronautics and Space Administration; Original Seven; Project Mercury; Sigma 7; space; Wally Schirra; Walter Marty Schirra, Jr.
“Schirra Gets Memento Key for Orbits.” RICHES of Central Florida accessed April 21, 2019, https://richesmi.cah.ucf.edu/omeka/items/show/6419.